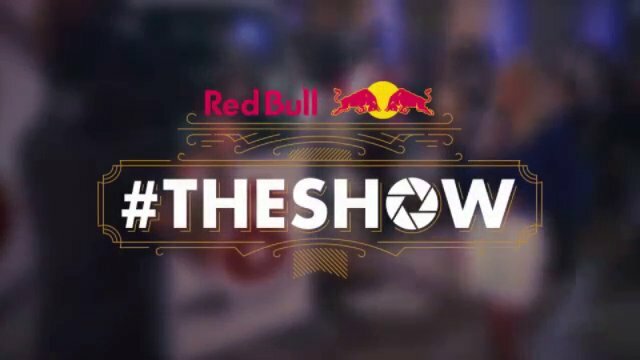 Red bull has introduced a new international campaign called #TheShow that enables Instagram users to create a video showcasing their photographs in the form of an exhibition. The campaign runs till February 16th, 2014 and is a 90 day only portal. To attract Instagram users using an online automated application. 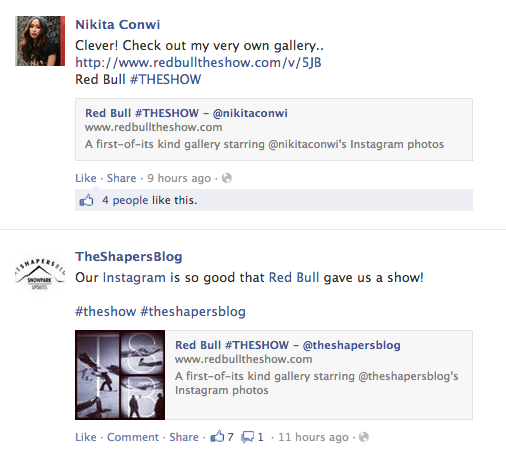 Red Bull labels the campaign as an “Instagram-centric experience” and it is certainly so. 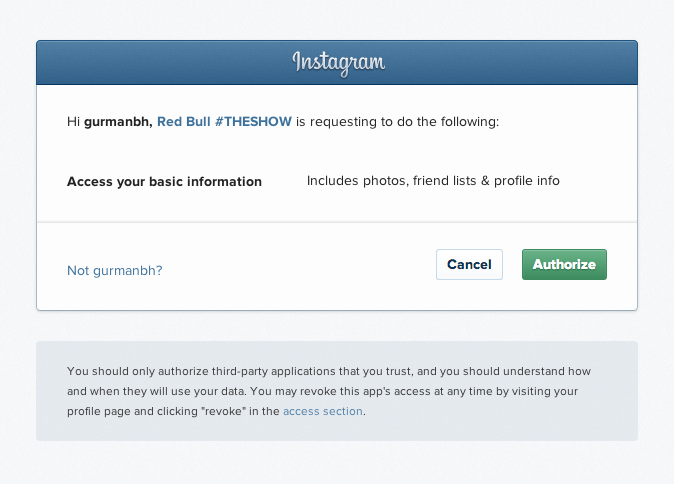 As you log on to www.redbulltheshow.com, you are asked to Sign in with Instagram. You sign in and are requested for the required permissions by the application. Once it fetches data from your Instagram account, it goes on to making a ‘show’ out of your pictures. However, there is one condition, you need to have over 25 photographs posted via Instagram to have your online video prepared. In case you are active on the platform and have 25 or more photos up, the application starts creating your ‘show’. The show is basically a collection of your Instagram pictures collated in a video. You see your pictures hanging in an exhibition with your name on the entry of the hall.There is even a guest list with all followers’ names on it. As you move in, there are art critics and other people discussing your photographs. And the attention given to detail can actually come as a surprise. Overall, production values of the video are quite high and each video created is a unique mix of shots. Other highlights include an appearance by Olympic Champion in Ski Alpine Downhill, Lindsey Vonn and Formula 1 star Mark Webber reacting to user photos sent to them from the gallery show. Users can share these videos on Facebook, Twitter and Google+. 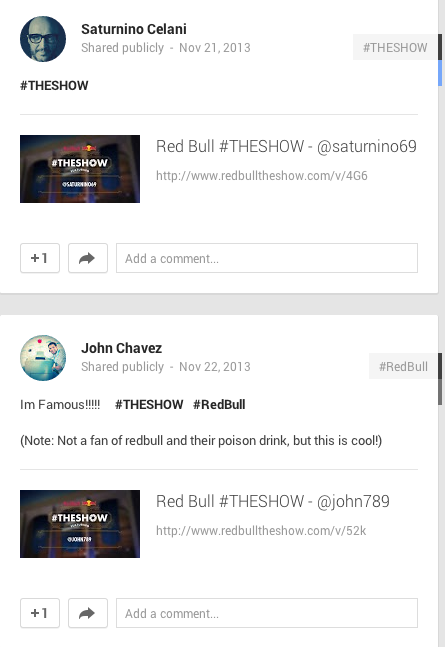 These automated tweets and posts also carry the hashtag #TheShow. In fact, several users have been sharing and engaging with the concept already on various social media platforms. Creators of the video can also download these videos in an .mp4 format and embed them on other digital spaces. As soon as I came across this campaign, it struck me that no brand has done an Only-Instagram campaign and this makes it so unique. 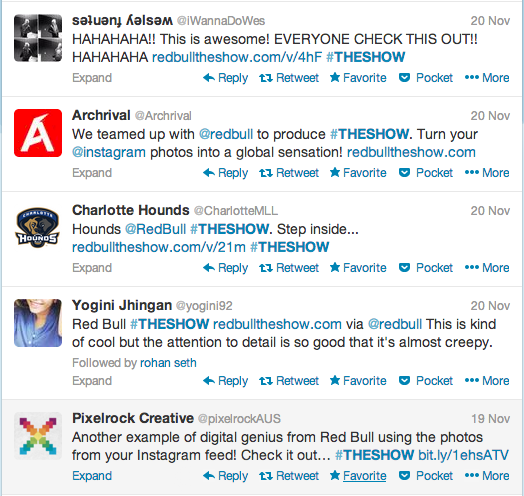 Amidst the growing number of online applications that digital strategists are using to target consumers, Red Bull’s #TheShow surely displays high production values. As several users point out on their social media platforms, in ways it makes them feel like a ‘star’. The reiteration of the branding within the video is good as well – you see the Red Bull logo in multiple places and in the voiceover as well. Moreover, the promotion of the campaign is in place with publicity taking place on both international and national portals. The best part is that there is an active sharing mechanism built in, and since this is creating good content, the users end up sharing it on their own. Though the use of a hashtag is appreciable, it could have been more unique. Searches for #TheShow on various platforms brings in other results as well. The use of a more unique hashtag, one that incorporated Red Bull as well could have been better. The brand could also share few galleries that are already up on public portals in order to generate a greater buzz. 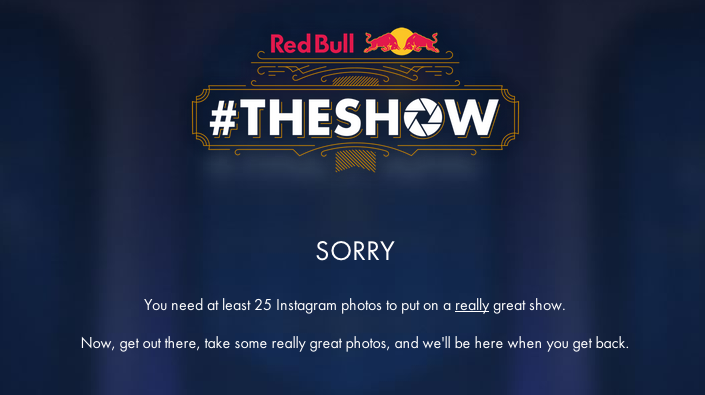 Red Bull’s #TheShow campaign is an interesting use of Instagram. While most brands ignore the platform for engagement, Red Bull has managed to generate activity from people that are not even loyal customers. It is managing to create a buzz rather well and with quality content, it seems to be hitting a success. Cobrapost's Stings IT firms with Operation Blue Virus. How Authentic is this?